Each turn, choose which side of your cards will be played. Each step of your journey, manage your Expedition's resources sparingly. Each game, create a new party of Characters. 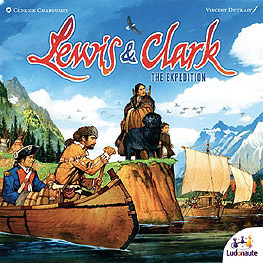 Based on the historical exploration across America the game expands on this by making players part of competing exploration teams racing to reach the goal first. Along the way they will recruit other adventurers and Indians to aid them on their quest, all of the cards represent real people from that time and the rulebook provides a brief description of their history as well as their ability in game terms. This makes it quite interesting but does not distract from the game itself as you can read all this additional text at your leisure. I have the the 2nd edition reprint which apparently has some component changes from the original, like a smaller gameboard and changes to the card stock as well as a different sized box. I can't comment on the quality of the original print run but I can certainly say that I am generally pleased with the quality of this version. This is a damn pretty game with lots of colour and attention to detail, the artwork throughout is superb with the resource tokens being wooden hexes. The cards are decent quality stock, though a little on the thin side so as they will be handled a great deal would be prone to bending. I have sleeved mine, which I always do if the cards are likely to get a lot of handling, and this makes them feel a lot more robust. The player boards and their upgrades are a decent thickness cardboard and well illustrated which is nice. The cards themselves have multiple uses and the players start with the same basic abilities 4xresource gathering cards, 1xmovement card and 1xInterpreter. On a players turn they have a compulsory action and two optional actions, the optional actions can be done before or after the compulsory. The compulsory action is to either play a card for its action or use an Indian in the Village on the board to activate one of the actions there. To power the cards action you will need to either use another card (flipped over and slid under) and/or use Indians. The optional actions are to camp (take your cards back) or recruit Characters. I like the mechanics of this game and it causes you to make harsh choices fitting the theme of the game. Whilst this can be described as a race game, it is so much more than that with a good feeling of tension as players try to make efficient use of their actions to keep up with the other players. Essentially you need to build an efficient card engine that allows you to move and camp progressing you up the river route to your destination. Overloading your boats or keeping too many cards in your hand when you camp causes you Scout to be moved backwards down the route undoing all your hard work. Though your camp can never go backwards, you Scout certainly can hindering your progress. There are actions to be taken that can help strip unwanted cards from your hand helping you to streamline your options. It is also worth noting that partway through the river the terrain turns to mountain meaning you need to switch what resources and methods of movement you need. This provides a great catchup mechanism in the game as players have to adapt their strategy to cope with the new requirements. The game also comes with tokens to change the layout of the mountains and river to enable you to make the game easier/harder for future games making for a lot of playability. The first couple of games feels like the game is a little over long but this would be doing the game an injustice. I say that because there is a lot to take in when you first run through this game and I feel it takes a game or two to really appreciate what you can do with the right combination of cards. With experienced players the game turns will be a lot slicker and the overall gametime will reduce. All that said it never really feels like it outstays it welcome and in fact you hardly notice the time ticking by as you are constantly looking at your options in between turns. This is another game that manages to engage the players in its theme allowing you to feel the tension and pressure as you try to make your expedition the first to reach the goal. Fantastic game, which always results in a close end game, the fact there are always different cards out each game keeps it fresh and interesting.